Meet the Raisins! is a 1988 claymation television special directed by Will Vinton, featuring the advertising characters The California Raisins. It was the Raisins' second appearance in a primetime special and their first dedicated feature. Meet the Raisins! spoofs musical documentaries with its use of anthropomorphic produce characters. Through its historical perspective, the special also provided an opportunity to elaborate on the personalities and introduce names of the simple yet popular characters. 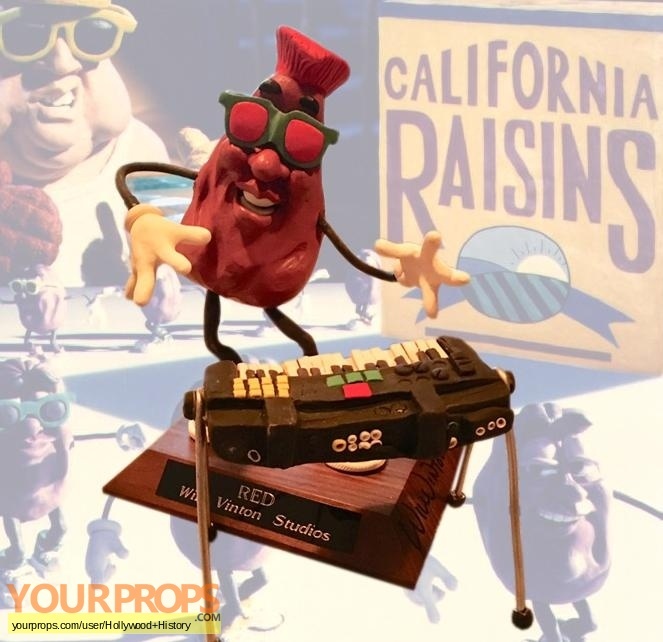 It follows the California Raisins' humble beginnings, rise to musical success, fall from stardom, and eventual comeback. This is the screen used puppet and piano from Vinton Studios of the musician raisin known as Red. view all 305 items of "Hollywood History"
** The content of this listing is the sole responsibility of Hollywood History. Yourprops.com, its owners, agents and assigns assume no liability.